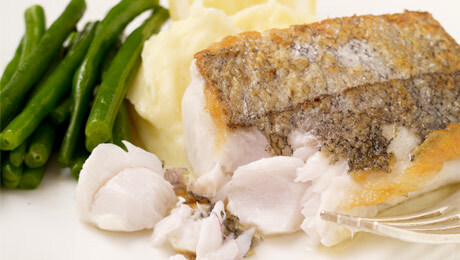 You could also use Cod, Haddock, Pollock or Salmon if you wish. Place in a large saucepan and barely cover with water. Add the garlic cloves unpeeled to the water and cook for 25 minutes until the potatoes and garlic are tender. Drain the excess water from the pan, and peel the cooked garlic cloves. Return the potatoes and garlic to the pan and using a potato masher roughly mash the potato and garlic together. Add half the butter and the milk to the potatoes and garlic then beat with a wooden spoon until fluffy. Trim the green beans and place in a small pan of salted boiling water for 4-5 minutes. Remove from heat and toss in the remaining butter and season with salt and pepper. Season the fish, and place the flesh side of the fish into the flour, lightly dust the fish, tapping gently to remove any excess. Drizzle some olive oil in a pan then place the fish flesh side down in the pan. Cook for 6-7 minutes on each side. To serve, place a large scoop of mash into the centre of the plate and place the fish by its side with some buttered green beans and a drizzle of lemon juice.